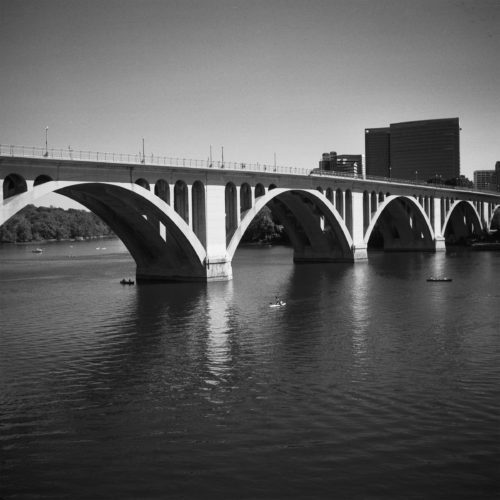 Key Bridge is arguably the most beautiful of the bridges that connect Washington, D.C. and Virginia. This is a view of Key Bridge from the old Aqueduct Bridge Abutment in Georgetown. The Aqueduct Bridge was built to transport cargo-carrying boats on the Chesapeake and Ohio Canal in Georgetown across the Potomac River to the Alexandria Canal. The Aqueduct Bridge closed in 1923 after Key Bridge was constructed, and it was demolished in 1933. It is a little scary walking out to the edge of what remains of the old bridge where there’s an alarming drop off, but I’ll do almost anything to take a picture.